That's a wrap... The new CEBIT came to a close last week, and for the first time we were in Hall 13 as well outside at the d!campus festival grounds. The party's now over, we hope you had as much fun as we did! Goodbye CEBIT - see you next year! 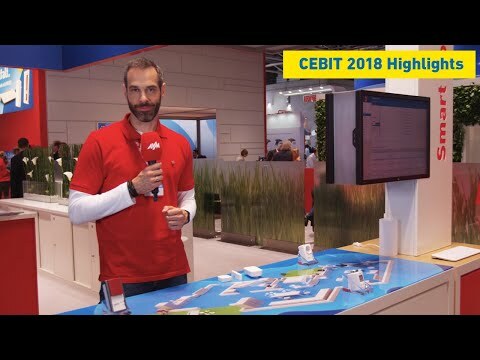 AVM at CEBIT 2018: The Highlights Join Gordon Priebe as he shows you around AVM's stand at CEBIT 2018 and learn more about the latest FRITZ! products and technology. This year it's all about FRITZ!OS 7, mesh networking, smart home, FRITZ!Fon functions. Hello CEBIT! Hello NEW! CEBIT, the world's largest trade fair for information technology, is over for another year. We hope you enjoyed the AVM highlights and FRITZ! products both inside and for the first time outside at the d!campus festival grounds. We hope you had fun: there were retro games such as DR!FT model car racing and Germany's only PONG table. World champion Stefanie Schmid was also there to give foosball lessons. Goodbye CEBIT - see you next year! More Coming soon: FRITZ!OS 7 AVM presented FRITZ!OS 7 for the first time at this year's CEBIT. The genius behind our products is jam-packed with new features, designed to help you get the most of out of Mesh WiFi, Smart Home and telephony. More FRITZ!Box with high speed thanks to supervectoring Ready for the future: with its support for supervectoring 35b, the FRITZ!Box 7590 is setting new standards. This new DSL technology allows for top download speeds of up to 300 Mbit/s. FRITZ!Box 6590 – a star in the cable sky The FRITZ!Box 6590 Cable offers everything you could wish for in your home network: high-speed wireless AC, integrated IPTV, a powerful telephone system and much more! FRITZ!Box 5491 and 5490 for all common fiber optic connections AVM has two devices that can be used directly at fiber optic outlets: the FRITZ!Box 5491 and 5490. The FRITZ!Box 5491 supports GPON, while the FRITZ!Box 5490 supports active point-to-point technology (AON). This means that FRITZ!Box can be deployed directly at all common fiber optic connections. FRITZ!Box 6890 LTE - the do-it-all router for LTE or DSL The FRITZ!Box 6890 LTE provides high-speed Internet via mobile networks. No matter how good your current reception is, the 6890 always provides maximum speed. What's more: you can also use the FRITZ!Box 6890 LTE on DSL connections.